“Nothing will change this week,” said Aris Karnachoritis confidently as the waitress handed out bottles of beer and frosted glasses to him and his friends. Constantinos Neocleous, sitting beside him at a table on the beach at Vouliagmeni near Athens, nodded in agreement. “It’s not in anyone’s interests to have a crisis now,” he said. Beyond the beach lay shallow waters of radiant turquoise. Children paddled. Teenagers romped. And from nearby, where a group of young men were playing beach tennis, came the comforting “plock-plock” sound of bat on ball. The talks between Alexis Tsipras’s government and its creditors have dragged on for so long that it has become hard to believe there will ever be a decisive make-or-break juncture. And never has that been harder to believe than now, with the arrival of summer and the entrancing distractions it brings to a country like Greece. 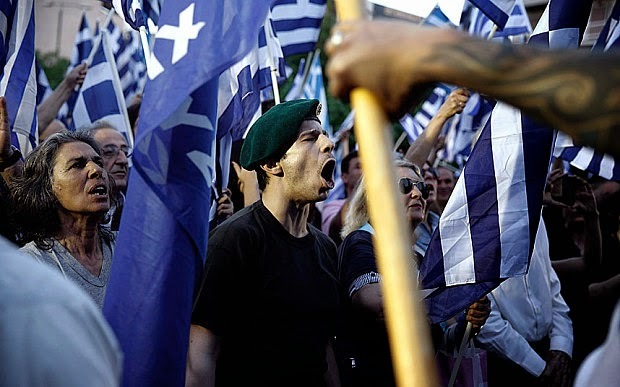 There is a striking disconnection in Athens between the blithe lack of concern that the government evinces, and which it has successfully communicated to much of the public, and the objective seriousness of Greece’s plight. This week Greece and the eurozone face a week of fresh nail-biting uncertainty as the single currency area’s finance ministers prepare to report on progress towards an agreement with Tsipras’s government. On Tuesday Greece is due to repay €770m (£560m) to the IMF. A deal with its creditors – the European commission, the European Central Bank (ECB) and the International Monetary Fund (IMF) – on moves to liberalise the economy would give it access to the remaining €7.2bn from a €240bn bailout. But it has refused to budge on two “red-line” demands – for pension cuts and looser rules on hiring and firing – and hopes of reaching an agreement in time for a meeting of the finance ministers on Monday have gradually seeped away. On Thursday Greece’s finance minister, Yanis Varoufakis, promised that the IMF would nevertheless get its money. Armageddon – a Greek default on its borrowings followed in all likelihood by exit from the eurozone – may once again have been postponed. But for how long? Beyond the IMF deadline loom far bigger repayments the government has to make to the ECB in the summer. Yet it is already so desperately short of funds that it has ordered local authorities and public bodies to turn over their cash reserves to the central bank. “We have only the money to pay for this month,” conceded Karnachoritis, a young civil engineer, as he sipped his beer. “But that has been the situation for the past two months.” Like his companions, he thought it would take several more months to reach an agreement. “I don’t believe anything will happen before September,” he said. Certainly, the government could do with time to lower the expectations it created and which swept Syriza to power last year: expectations it could renegotiate the terms of Greece’s bailout and convince Angela Merkel to abandon fiscal austerity. The evidence of real and painful economic hardship is subtle in Athens. But it is there. As it passes through Dafni, a suburb of the capital, the road to Vouliagmeni becomes a shopping area. About four out of every five shops has closed. In the centre of Athens, the executive of a manufacturing company described how his firm was having to pay in advance for imported components because the exporters could not insure their credit risk. “We are paying up front to companies the firm has dealt with for 20 years. That hurts. And it costs,” said the executive, who requested anonymity because he was not authorised to speak on behalf of his employers. Kostas Panagopoulos, of Alco Polls, said a survey he carried out last month indicated the public was already resigned to compromise: 52% of respondents said they wanted a deal with Greece’s creditors “even if the prime minister had to step over those red lines”. Tsipras’s real challenge, said Panagopoulos, is to “overcome the resistance of groups within his own party and that of the small right-wing party” with which Syriza is in coalition. Panagopoulos thought the prime minister’s most likely course would be to go to the country with a referendum. On Friday when Tsipras reported to parliament on the negotiations, he left a notebook behind. The journalists who seized on it found he had drawn a doodle of a ballot box. “I believe he did that on purpose,” said Panagopoulos. In recent days Tsipras’s ministers appear to have embarked on a drive to push out the time horizon for a solution. Varoufakis suggested Monday’s meeting could be a “platform” for an eventual accord. On Thursday the deputy prime minister, Yannis Dragasakis, told the Guardian the government no longer wanted an interim deal but a comprehensive agreement. The question is whether the time is there to be won. A referendum cannot be arranged overnight. Yet there are doubts about whether – even if the government repays the IMF on Tuesday – it will have enough cash left for pensions and wages come the end of the month. Pressure is building elsewhere. The ECB has been propping up Greece’s commercial banks with emergency lending that the other eurozone countries, which are the ECB’s shareholders, fear may never be repaid. Last week saw a reportedly “intense” meeting at the central bank’s Frankfurt headquarters as some countries lobbied for the imposition of tougher conditions. That, however, could prompt a loss of confidence in Greece’s financial institutions and a run on its commercial banks’ deposits. Not everyone views the situation with equanimity. Seating at a nearby table in the restaurant-bar at Vouliagmeni, dressed in ripped denim shorts and a crocheted bikini top, was Rania Mavroyani, who said she lived off property that had been left to her. Might Greece be better off leaving the eurozone and going back to the drachma? “The drachma?” she repeated, and even through her sunglasses there was no mistaking the alarm in her eyes. “I don’t want it back. We must belong to Europe,” she said. But was a return to Greece’s pre-euro currency a possibility? I'd be scared too if I were living in Greece but most Greeks are either hopelessly delusional believing whatever Tsipras and his cronies are feeding them, or just so disillusioned with the entire process of endless discussions which go nowhere that they're praying for a miracle. But drachma or no drachma, they know they're in for a lost decade or possibly much worse. German finance minister Wolfgang Schauble said over the weekend that Greece risked spinning into default unless there was a breakthrough soon. "Such processes also have irrational elements. Experiences elsewhere in the world have shown that a country can suddenly slide into insolvency," he told the Frankfurter Allgemeine. Greek officials retort that this is a conceptual misunderstanding by the German and North European authorities. Syriza officials say they may trigger the biggest sovereign default deliberately if pushed too far, concluding that it is a better outcome than national humiliation and the betrayal of their electoral vows to the Greek people. "If it comes to the crunch, Greece must default and go its way," said Costas Lapavitzas, a Syriza MP and member of the party's standing committee. "There is no point raiding pension funds to buy time. We just exhaust ourselves for no purpose." "We went up and down Greece in the elections urging the voters to throw out the old government. The question now is whether we mean what we say, and whether we have the courage of our convictions." Officials say Russian president Vladimir Putin has offered Greece roughly €2bn up-front to smooth the way for the so-called "Turkish Stream" gas pipeline. While this would allow Greece to meet its IMF payments in May and June and then default later to the European Central Bank - deemed the real foe - it would not solve any of Greece's problems. The implicit quid pro quo would be a Greek veto on an extension of Western sanctions against Russia. Such a decision would damage the rift with Europe beyond repair and would infuriate the Obama White House, which still has some sympathy for Syriza. It is understood that US Treasury Secretary Jacob Lew told the Greeks that they would be "dropped like a stone" if they played this game. Amos Hochstein, Washington's energy envoy, said in Athens on Friday that the pipeline was a foolish distraction. "Turkish Stream doesn't exist. There is no consortium to build it, there is no agreement to build it. So let's put that to the side," he said. Behind closed doors he has imposed an emphatic American veto on the whole plan. I never bought the whole "from Russia with love" distraction. This was another feeble attempt from Syriza's leaders to divert attention away from the real problems in the Greek economy. As one of Greece’s three main creditors - alongside the International Monetary Fund and the European Commission - the central bank is unique in wielding the power that can ultimately force the country out of the single currency. Not only has the ECB rebuffed requests for temporary financial relief, but its disciplinarian stance has led to accusations that it is acting ‘ultra vires’ - taking politically motivated action outside of its legal remit to ensure financial stability in the eurozone. The first controversial move came as Mr Tsipras and Mr Varoufakis were hot-footing around Europe, drumming up support for their government’s nascent plans to rip up Brussels austerity contract. On February 4, the ECB's 28-member Governing Council took a late-evening decision to remove its ordinary funding operations for Greek banks. I will let you read the rest of that lengthy article here but if you ask me, the real villain in the Greek crisis is this disconnect between Syriza's red line demands on pensions and wages and creditors who are demanding that Greeks reform their economy once and for all and stop buying votes by expanding the ever bloated public sector. Quite disturbingly, an ever defiant Syriza government passed a law last Tuesday night which opens the way to rehire thousands of workers cut loose from the country’s inefficient public sector in a reform enacted by the previous government. The country is on the verge of collapse and the clowns running Greece are back at their old games, buying votes with money they don't have. No wonder German Chancellor Angela Merkel is coming under growing pressure from within the ranks of her own party bloc to give up on Greece for the sake of the euro. Germany's finance minister, Wolfgang Schaeuble, said his country will do everything it can to keep Greece in the eurozone under "justifiable conditions," but he certainly doesn't take Syriza's leaders seriously and has repeatedly expressed his frustrations negotiating with them. Interestingly, the Germans are now calling for a Greek referendum as IMF default is avoided. Mr. Schaeuble says plebiscite on Greece's euro membership could prove "helpful" as Leftist government promises to stick by "red lines." For his part, Greek finance minister Yanis Varoufakis keeps harping on a new deal for Greece but he fails to address the real problems plaguing Greece, its ever bloated and inefficient public sector that is weighing down the country and lack of much needed reforms to modernize their economy once and for all. The BBC also reports that Greece is urging eurozone ministers meeting in Brussels to recognize progress made in talks, but who can take these guys seriously? This is progress? Hiring public sector workers who were fired and increasing pension benefits when the country is on the verge of collapse? Former German Foreign Minister and Vice Chancellor, Joschka Fischer, is absolutely right, Tsipras is in Dreamland. Either he doesn't understand the gravity of the situation or he's playing a dangerous lose-lose game, antagonizing the country's creditors to the point where they're left no choice but to kick Greece out of the eurozone. Of course, kicking Greece out isn't as simple as many claim. If it was, it would have been done by now. The reality is that a sovereign debt default within the eurozone will spell the end of the union and heighten risks that other countries will follow. And German banks are hardly in great shape to withstand such a shock. Grexit will also exacerbate deflationary pressures at a time when the world can ill afford global deflation. Any solution to Greece's financial woes is more of a political than an economic question, European Central Bank policymaker Ewald Nowotny said on Monday, as euro zone finance ministers meet to continue Greek debt talks. Top officials have voiced little optimism about a breakthrough at the meeting. Nowotny declined to suggest a way out of the impasse, reiterating that the ECB's role was to ensure price and financial stability. He cited Monday's talks by euro zone finance minister, adding: "It would be premature to give any details," he told a panel discussion on Spain and Austria. Unless there is political will on all sides to reach a more permanent solution, this endless Greek tragedy will continue into the summer, making an already explosive situation far worse. That won't bode well for risk assets and the global economy going into the Fall. Below, EU paymaster Germany suggests that Greece might need a referendum to approve painful economic reforms on which its creditors insist, but as Sonia Legg reports Athens says it has no such plan for now and others warn a vote could delay vital aid. Also, Marc Faber argues that preventing Russian influence in the Mediterranean is the real reason why Europe will never allow Greece to leave the eurozone. "If Greece leaves, the North Atlantic Treaty Organization [NATO] countries led by America are very afraid that Russia will establish closer relationships [in the Mediterranean]." Faber is right but my biggest fear is that allowing Greece to remain in the eurozone at all cost when the country desperately needs to cut its grossly bloated public sector to an appropriate size and reform its antiquated economy will only widen the Greek disconnect much further and doom its citizens for another decade. Something is going to give and I'm not sure preventing Russia's influence in Europe will take precedence over reforming the antiquated and hopelessly inefficient Greek economy once and for all.